The mightiest of Avengers is back in his sequel to take on Malekith, leader of the dark elves. The movie starts off with a tale of before Odin, when Malekith (Christopher Eccleston) attempted to bring darkness forever to the Nine Realms with an ancient powerful material known as Aether. Odin's father Bor was able to defeat Malekith where he and his higher ups secretly escapes into space in suspended animation. The aether foolishly was buried away where no man can get to. 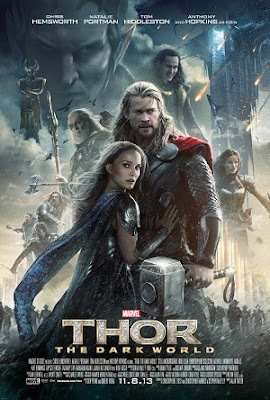 But of course, a woman, namely Jane Foster (Natalie Portman) while searching for Thor was able to. What you'll love about the film is Tom Hiddleston and lots of him. Playing the side of the good guy til it suits him otherwise his dynamic with Thor has always been hilarious. The cameo of one Steve Rogers during Loki's fun is one of the highlights of the film. The weaponry of the dark elves are amazing, especially what I call the "black hole" grenades. The fight scenes are amazing, especially with Thor's Mjölnir for some hammer time. Casually jumping off a balcony and catching a ride with his hammer to battle. What I didn't like was the dark elves advanced technology just seemed so out of place. They would've made great characters for a Star Trek or Star Wars movie but for Norse Mythology centric Thor it just didn't seem to fit. Sure in the comic books we've seen Thor ventured to space many times and took on aliens. (He even fought some in Avengers.) But it just felt weird watching the Asgardians with their swords and shields taking on laser guns and these "black hole" grenades. Another thing I would have love to have seen is a stronger female character in Jane Foster. Yes, she's a mortal caught in a war among gods and dark elves. But she just looked so needy and weak, clamoring for Thor, like on her blind date near the beginning. Overall, while the film was enjoyable it was not as big as a smash for me as the first film. Perhaps if they had a more recognizable villain in say Hela, I would've given this film a higher rating. As you may have heard, be sure to stay for extra scenes during the mid-credit (relating to upcoming Guardians of the Galaxy movie) and after the credits for a heartwarming and silly scene. Avengers 2 as we already know will be Age of Ultron. While the third Avengers film has all clues pointing to Thanos and the infinity gems.